Capital of the kingdom of Saxony; situated on both banks of the Elbe. The presence of Jews in the city or in its vicinity as early as the beginning of the eleventh century is evidenced by the proceedings against Margrave Gunzelin (1010), who, among others, was accused of selling Christian slaves to Jewish merchants. The first official document, however, directly concerning the Jews of Dresden, as well as those of the other cities of Meissen, is dated 1265. In that year Henry the Illustrious regulated the differences between Christians and Jews. From these regulations it may be inferred that the main occupation of the Dresden Jews was money-lending. According to an old chronicle, a great auto da fé of the Dresden Jews took place on Shrove Tuesday, 1349 ("Chron. Parvum Dresdense," in Menken's "Script. Rer. Germ." ii. 332). It is possible that this was connected with the Black Death, although Dresden was but slightly attacked by the plague. The Dresden Jews figure again in official documents in 1368, with regard to special taxes imposed upon them, amounting to 1,000 gulden every other year. In 1425 Duke Frederick reduced these to 875 gulden, with the stipulation that the sum should be paid in gold of good quality and of a certain weight. Accused, in 1430 or 1432, of favoring the Hussites, the Jews were banished from Dresden, and their synagogue, situated in the place which still bears the name "Judenhof," was transformed into a distillery. The banishment, however, seems not to have been general, as exceptions were made in favor of those Jews whose services to the city were recognized. Thus in 1448 the princes Ernst and Albrecht granted to a Jewish physician named Waroch (probably Baruk), with his two sons Meïr and Moses, the privilege of settling in Dresden on the condition that Waroch should attend all the patients committed to his care by the princes. For this service he was to receive yearly thirty bushels of corn, one cask of wine, and a cow. In 1700 the court factors of August II., Berends Lehman and Jonas Meyer, who had hitherto lived at Hamburg, settled in Dresden. They were soon followed by many other Jews, whom they took under their protection. During the following twenty-five years the number of Jews living at Dresden must have greatly increased; for in 1725 the government, which endeavored to enforce the decree of banishment, thought it necessary to issue an order forbidding to those Jews who did not belong to the households of the court factors the right to sojourn in Dresden, except while fairs were being held. Ten years later the Christian merchants of Dresden lodged with the government a complaint against Jewish competition. In 1746 new regulations were issued, rendering residence in the city unbearable to those Jews who by special permission had settled there. They were not allowed to build a synagogue, but had to meet privately and to preserve the strictest silence. A heavy poll-tax was imposed, which was further increased in 1749. Still the community gradually increased, and at length the absence of a Jewish cemetery was keenly felt. After many negotiations the Jews obtained from the government a plot of ground in Neustadt for the sum of 1,000 thalers, paying 5 thalers for each interment. The first to be buried in the cemetery was the widow of Isaac Meyer, bullion contractor to the mint. The government continued to hamper the development of the community. New laws were enacted in 1772, restricting still further the right of settlement in Dresden. No Jew was allowed to reside in the city without special permission. In order that no unprivileged Jew might be clandestinely harbored, each Jewish family was subjected to a monthly police visitation. The poll-tax was increased; every adult male being assessed 70 thalers annually, in addition to a tax upon his wife and children. The price of a permit for a Jewish marriage was 40 thalers. Every means of gaining a livelihood was barred to the Jews, with the exception of money-lending and of rag-dealing in the Judenhof. Many were thus unable to pay their taxes, and in 1777 several hundreds would have been banished but for the intervention of Moses Mendelssohn. Still, in spite of all these restrictions, at the end of the eighteenth century there were about 900 Jews in Dresden. In 1803 the community organized, and nominated as rabbi David Wolf Landau of Lissa, who filled the office for fifteen years. He was assisted by the leaders, Mendel Schie, Samuel Kaim, and Hirsh Beer. From 1820 to 1861 Dr. Bernhard Beer was very active in promoting both the spiritual and material welfare of the community. 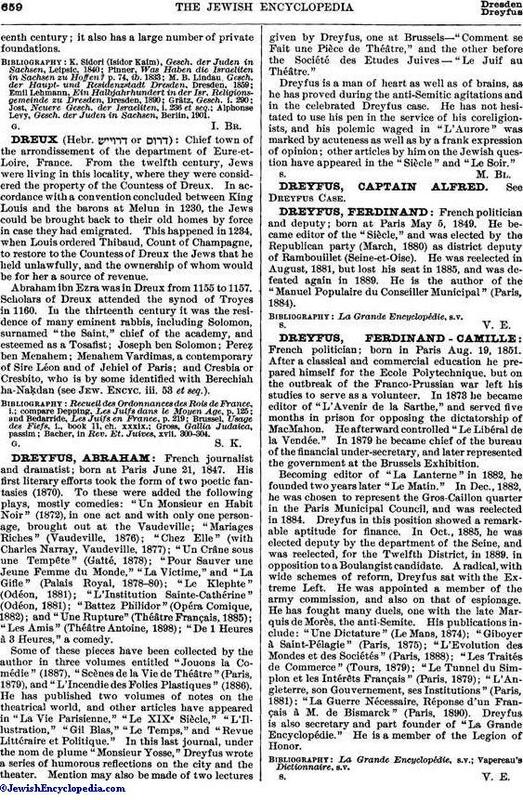 Landau was succeeded in the rabbinate by Abraham Levy, who in 1835 was followed by Zacharias Fränkel. Owing to the great abilities and zeal of the latter, the community obtained in 1837 permission to build a synagogue, which was inaugurated in 1840. The political situation of the Dresden Jews remained precarious. Some trades and handicrafts were opened to them by the decree of 1838; but their disabilities were still very numerous, and the repeated petitions of the community and the intervention on their behalf of some Christian notables, as the philosopher Krug, were of little avail. The government of Saxony remained deaf to all solicitations, despite examples of more favorable treatment of the Jews shown by neighboring countries. It was not till 1868 that the Dresden Jews, after a long and persistent struggle, secured all the rights of citizenship. On the removal of Fränkel to Breslau in 1854, Dr. Wolf Landau succeeded him, and in 1886 the present rabbi, Dr. Jacob Winter, was elected. 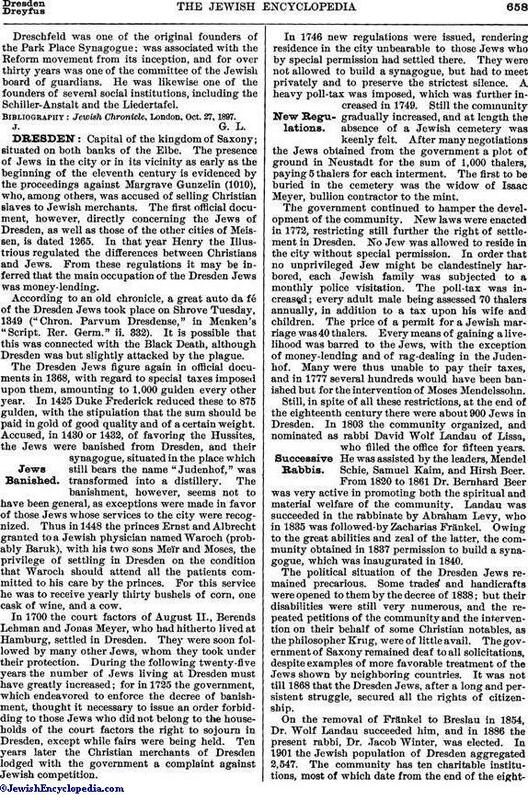 In 1901 the Jewish population of Dresden aggregated 2,547. The community has ten charitable institutions, most of which date from the end of the eighteenthcentury; it also has a large number of private foundations. Alphonse Levy, Gesch. der Juden in Sachsen, Berlin, 1901.